I think this tip is a gem. Put on your socks inside out. Apply Bodyglide (or whatever lube you use) directly onto the socks in the same places you would if you were lubing your bare feet. Remove socks, turning them right-side out. The lube is now on the socks, exacly where you need it. Pre-lubed, and ready to roll. Great time saver in T1 or T2. Great rides Sat and Sunday for me. I have to say, I'm enjoying the half Ironman raining as opposed to the full Kahuna. Nice challenging rides, but I still have plenty of free time on the weekends. I'm going to let myself enjoy this this year, before I tackle Ironman training again in 2010. 3 hours ride. Went great. All my riding it done as percentages of my functional threshold (FT). I test for those numbers with my power meter, and Endurance Nation plans get me faster! 3 x (6' @ 100% of FT, 3' @ 105% of FT) Hit them all right on, or a little over. Sunday is an "always be pushing" (ABP) ride. After warm up, lock it down to 80-85% of FT. Ride consistently at that power for as long as you can. Break to drink, eat, then get right back to work. These are HARD. Deceivingly so. You look at them on paper and think, "that's no so bad." An hour into it, and you're thinking "WHOA BABY!" I love it. No doubt building up endurance in this way will pay dividends. I ended up with an average of 80% of FT for the ride. Next week I'd like to get that up a little higher. The main story today happened during a pit stop. My hubby was messing with my clanging derailleur, and I went to use the bushes. I stepped over a wire and into a clearing. As I am, um, indisposed, I hear something crashing toward me from behind. I turn around to see this freakin' BULL coming at me!!!!! I nearly crapped my pants!!! I never flew so fast in my life. The wire was obviously an electric fence. This thing was HUGE!!!! 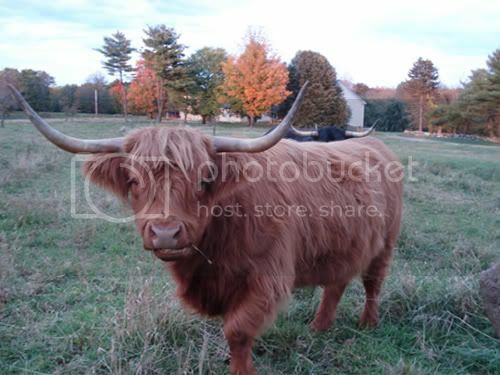 The local national park keeps a herd of these Scottish Highlanders, and it seems that I was in his pastureland. I pass them all the time when I ride, and they are cool. But no so cool nose to nose! If you don't have glasses with orange or yellow lenses--get a pair. I call them my "sunny day" glasses. When the world is dank and gray, putting on regular sunglasses just makes it even more depressing. Riding 3, 4, 5 hours in the murk is no fun. Put on the orange or yellow lenses and--voila--instant sunny day! It really tricks the mind into feeling more upbeat. My last six hour ride before my 2006 Ironman was done on a very gloomy day. My husband, who rode with me, was so unmotivated by hour 3--sinking deeper into the morass of blah. He was wearing regular sunglasses, which made the world even darker. I was fine, and kept telling him because I thought it was a sunny day. He tried on my orange lenses, and got a pair the next week. Cheap, rimless ones from Nashbar work fine. You don't use that that often, but when you need them, they're a great item to have. EN Coach Patrick McCrann is shown here running in Kona. Those funky sweatbands on his arms are simply the tube part of tube socks. He just folded some ice in there, and it was hands-free running while staying cool. Another teammate uses uses Desoto arm coolers as "ice sleeves." He says, "AMAZING. I just grabbed two Gatorade cups per ice at each station, shoved the ice in the top of each of the arm coolers, and this would keep me very cool for 2+ aid stations." The funny guy that he is continues, "These won my 2008 Best Race Innovation award. This season, I'm trying the Craft stuff that Tjorbjorn uses as a further attempt in my 'better racing through clothing innovation' series." Fill your hat with ice at aid stations, and throw a handful down your shorts. Top and bottom cooling. I've done this, and while I don't like the rivulets that melt down my face and legs, it does help keep you going. Sorry guys, can't help you here. But ladies, wearing that annoying article of clothing can help cool you down. Shove a handful of ice down the jog bra. Ahhhhhhhh! Trick is, moving it closer to the armpits makes it instant air conditioning! I've seen pro triathlete Barb Lindquist do this in race coverage on TV. Sure, it's obvious, but shading your eyes and not staring at hot, reflected sunlight off the pavement can trick your brain into thinking it's actually cooler than it is. Let's see what new tips come my way over the next few days! Triathlon Race Secrets--Shoes to Take You to T1 in a Hurry! Over in my team forum at Endurance Nation, we have a thread going about race secrets. Over the next few days, I'll post my personal winning suggestions. Here's one of my own I think isvery helpful! 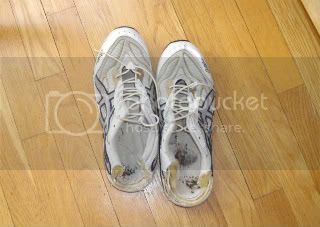 Cut the backs off of a pair of old running shoes. Cut out the tongue. Use elastic laces to hold the uppers together really loosely. Place on the beach at the swim exit. Slip on when you come out of the water, shuffle two steps to get your feet planted, then fly by the people tiptoeing over hazards, or limping up hill in T1. Following Your Dreams over a 186-foot-high Waterfall! Cool video! On April 21, Tyler Bradt, 22, kayaked over 186-foot-high Palouse Falls, breaking the waterfall world record of 127 feet. I'm the mother of four boys, and have lived through my share of physical adventures with them. This one I would not have wanted to even know about! Following dreams and having a death wish--this one seems like a fine line.